There may only be four remixes in total for now, but these are tantalising teasers for a whole album’s worth of such treatments, with names such as Vladislav Delay, Alva Noto or Matthew Herbert announced as contributors, due later on this year. Collected here are remixes from Ricardo Villalobos & Max Loderbauer and Michael Mayer for the first volume, with Steve Bicknell and Vainqueur heating up the grooves on the second. 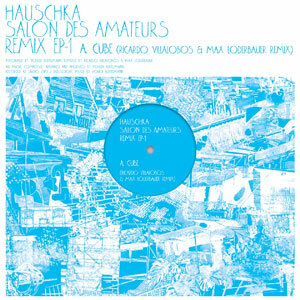 Masterfully handling Cube on the A side, Villalobos and Loderbauer proceed carefully with Bertelman’s array of odd broken sounds, retaining much of Hauschka’s idiosyncrasies, but propping them up with tight glitches and micro beats. They manage to infuse a new level of urgency to the original whilst keeping its delicate cinematic melody, and more importantly, its many variations, almost intact. That is, until the whole thing starts to stumble upon itself and eventually completely disintegrates. Michael Mayer, known amongst other things as one half of the founding team being Kompakt, offers a similarly respectful reading of Radar, but he strips the original of its brass section, isolates a couple of colourful piano or strings patterns and injects a hypnotic bass line straight into its core. The result is a captivating piece which never ceases to coil around itself and grow into a massively uplifting piece. The second volume gives a much more contrasted vision of Bertelman’s work, with Tanzbein being subjected to an intense electroshock session in the hands of Steve Bicknell, whilst Vainqueur’s René Löwe delivers a much more atmospheric revision of Ping. If there are few elements of Tanzbein remaining in Bicknell’s version, they are buried under a heavy motorik groove and only surface in waves. This constant flow of bubbling electronics, driven by an oppressive four-to-the-flour beat, takes Hauschka’s acoustic ‘techno’ across the Atlantic and plants it right in the heart of Detroit. Vainqueur on the other hand distills a deliciously dubbey ambient piece which is not without evoking Ultraworld-era Orb or, unsurprisingly, some of Löwe’s own work for Chain Reaction. Once set in motion, the piece slowly develops around a swirling hypnotic nucleus and appears to continuously project glowing burst of warm sounds into the ether, until its groove is progressively stripped back and eventually killed off. Released within weeks of each other, these two EPs offer four very different reworkings of Hauschka’s work, each taking the stance adopted by Volker Bertelman for Salon Des Amateurs into a very definite direction, some retaining much of his original compositions and wrapping them into their own sound, others tearing them apart and building something entirely new out of them. 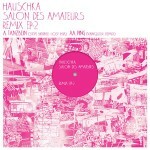 With a whole album’s worth of remixes due out in August, these two EPs can only whet the appetite for more!